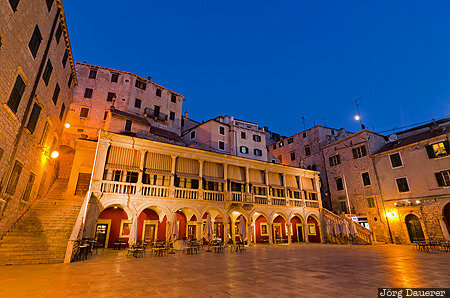 The flood-lit central Place of the Republic Croatia (Trg Republike Hrvatske) in ibenik at the blue hour after sunset. Scenes of the 5'th season of Games of Thrones had been filmed here (ibenik depicts the city of Braavos). ibenik is in ibensko-Kninska in the west of Croatia. This photo was taken in the afternoon of a cloudy day in November of 2014. This photo was taken with a digital camera.